I don’t know about you, but since just before Thanksgiving I have been running around enjoying the holiday season. For me that means cooking, eating out, trying to see as many friends as possible and being very busy. All in all I had Thanksgiving, Christmas, Hanukkah, New Years and finally my birthday celebrations all within just a few weeks. I’m slowly recovering and trying to get back to my normal routines! As I was driving home from work on Thursday I was struck with a sudden and strong desire to make chicken curry for dinner. I loved that I had all of the ingredients that I needed already at home. I could easily get on the treadmill for half an hour and still make an amazing dinner. I was happy that I was inspired to make a dinner and exercise after a long week at work. I got home and got my rice cooker ready to go and put in a cup of brown rice and water. Plugged it in and hit start, it was going to take 100 minutes to make the rice. Basically perfect timing – as it was cooking, I got on the treadmill and watched part of a movie on Netflix as I exercised for 30 minutes. After the treadmill, I went back upstairs chopped up my onion, carrot, and garlic before taking a shower. 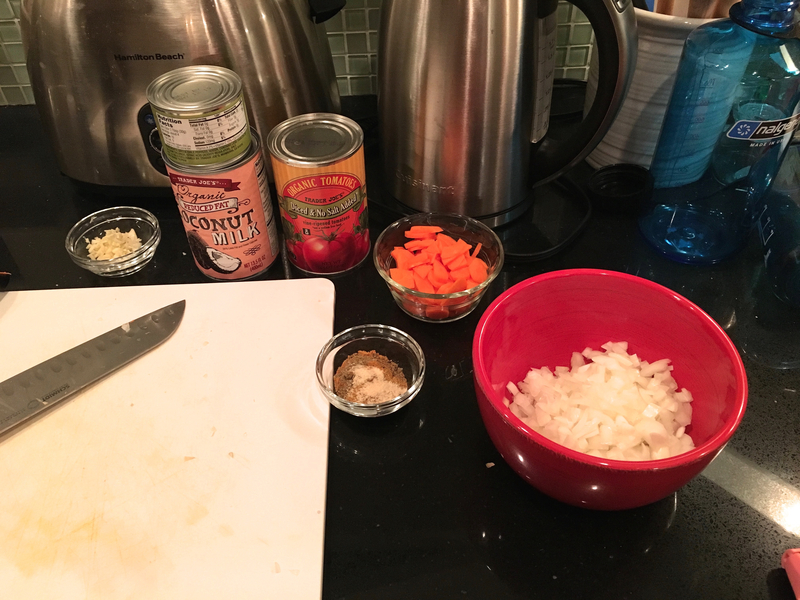 I measured out my spices and got my organic reduced fat coconut milk, diced tomatoes and small can of green chilis ready to go. I felt so organized! Post shower I got out two organic, boneless, skinless chicken breasts and cut them up into one inch strips. I heated up a tablespoon of olive oil (I should have used a little more). Once the oil was hot I added the onion. I always cook my onion first because I like getting it nice and translucent and that can take some extra time. After a couple of minutes I added the carrots. Then I added my chopped chicken and spices. I cooked this for several minutes until the chicken was no longer pink. Then I added the garlic. I always add the garlic last because I do not want it to burn! As the chicken cooked and the spices warmed up our kitchen started smelling really good (but the next day we discovered that our kitchen still smelled like curry!). Together with the brown rice cooking, our kitchen smelled like an amazing restaurant. 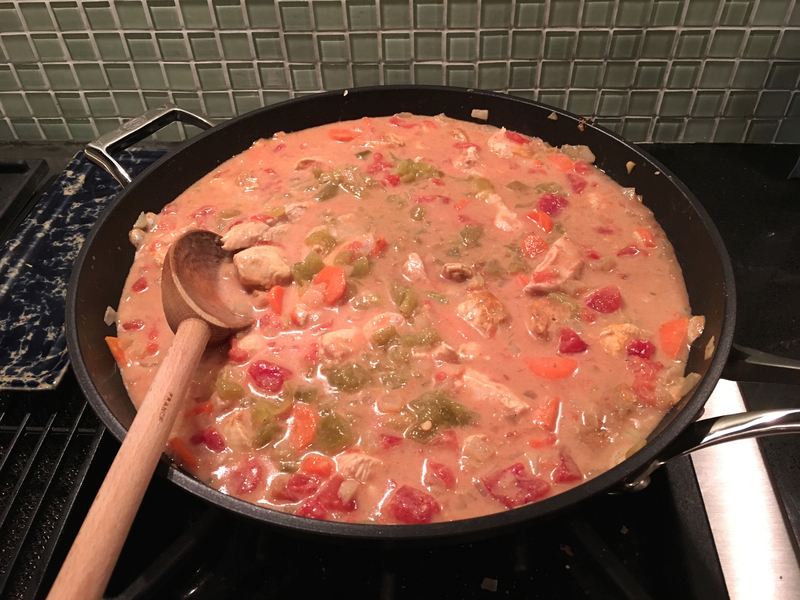 Once the chicken was no longer pink, I added the coconut milk, diced tomatoes and green chilis. Things were looking really good! The SC went out to get a coffee while I was on the treadmill and he came back with two key ingredients that we did not have. Chickpeas and naan. 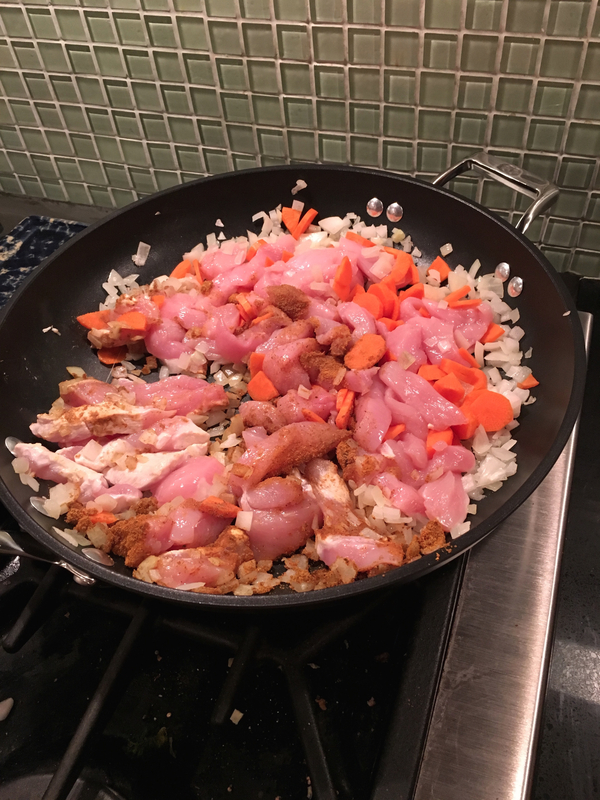 I thought we had everything to make the curry, and we definitely could have made it without these two ingredients – but I loved having both to add in to our delicious dinner. I added the chickpeas at the last minute – they definitely could have benefited for cooking a little more in the curry. The hands on time wasn’t much at all, and it was full of flavor and relatively healthy. I often crave take out food – but when I can make a dish like this I am so happy that I made it rather than paid someone else to make it. I like that I know everything that went into it and because of that I have a good idea how healthy or unhealthy what I am eating is. 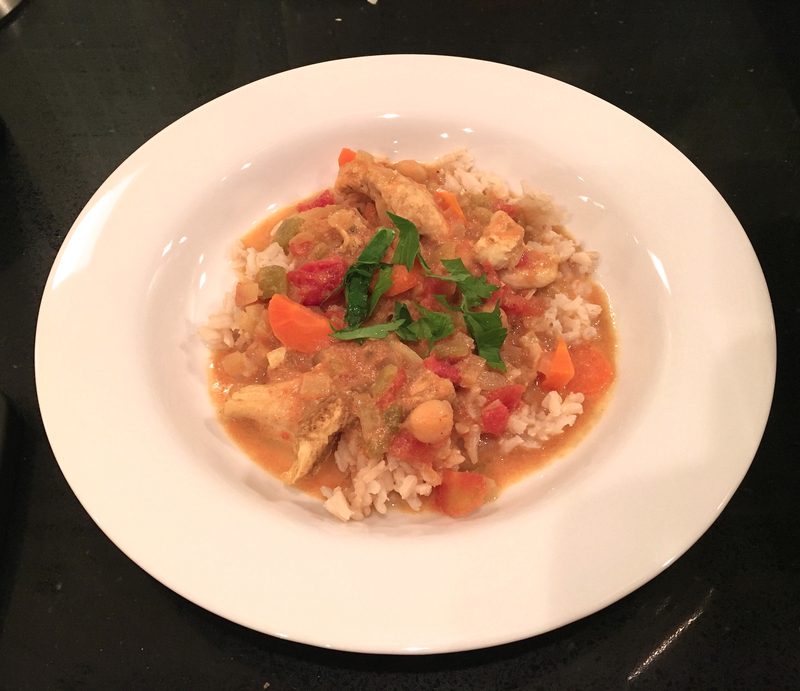 We definitely improved the dish by using reduced fat coconut milk, low sodium tomatoes, whole wheat naan and brown rice instead of regular white rice. This curry also made a delicious lunch the next day! It was a great meal for a cold and snowy winter night!